Johannesburg (South Africa) – It’s striker vs. striker as Africa’s hardest hitting middleweights go toe to toe at EFC AFRICA 22. Crowd favorite and undefeated JP ‘Tinkerbell’ Kruger takes on heavy handed Thumelo Maphutha while Frederich ‘The Ninja’ Naumann, the organisation’s fastest rising star, tests himself against brutal former welterweight champion Dallas Jakobi. 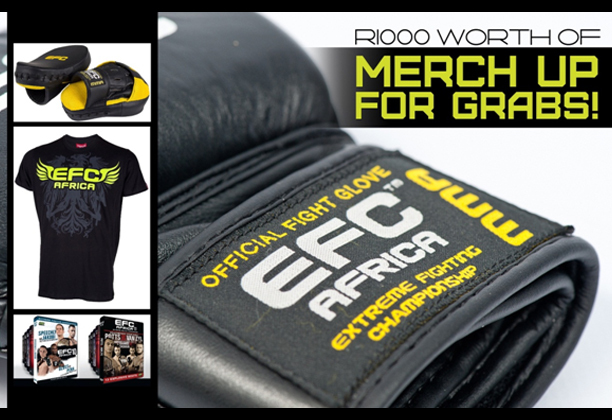 This week EFC AFRICA CLUB members stand a chance to win free merchandise. Simply purchase your EFC AFRICA 22 tickets before this Wednesday, August 07, send a photo of the tickets to info@efcafrica.com, and stand a chance to win R1000.00 worth of exclusive EFC AFRICA gear by lucky draw. EFC AFRICA CLUB members also benefit from a range of added specials including merchandise giveaways and EFC AFRICA CLUB member discounts. To join the EFC AFRICA CLUB visit the club page, register, and enjoy this and other great EFC AFRICA CLUB member benefits. EFC AFRICA 22 brings you 13 action packed MMA bouts in one night. Get your tickets now.